Volcano World is a Collaborative Higher Education, K-12, and Public Outreach project of the North Dakota and Oregon Space Grant Consortia administered by the Department of Geosciences at Oregon State University. 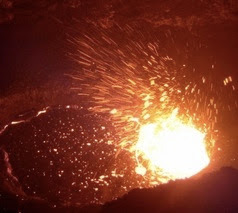 It presents news and information about volcanoes in the world with pictures and links. Right now, the East Java's Mud Volcano in Indonesia is featured on the main page. There are also pictures of Canary Island volcanic features. It also includes some sample project of volcano building in classrooms with some ideas on how to build a good volcano. There are also pictures from the space showing volcanoes on other planets. It is a link to add to your bookmarks if you are teaching earth science and volcanic eruptions.